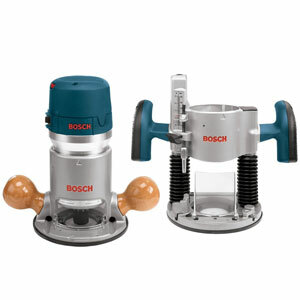 With its compact size and spirited performance, the 1.0 HP Colt Palm Router from Bosch is a very versatile tool. 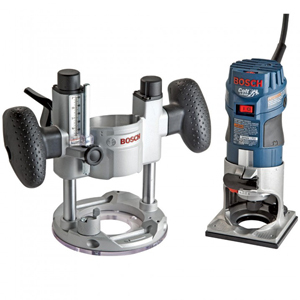 It's not just a laminate trimmer, but is ideal for trimming deck planks, hinge mortising, edge forming, slot cutting, dovetailing, window cutouts and decorative inlays. The PR20EVSK Variable-speed Colt Kit has a palm-grip design with Soft Grip to make it the most comfortable router in its class, yet it also has enough power to do the job and is more comfortable and easy to use than larger routers. The Soft start reduces start-up torque while the Bosch Constant Response Circuitry monitors and maintains speed under load for consistent performance and overload protection. Easily move the motor from base to base with the Quick-clamp System to work on other areas of your project. A convenient Front Spindle Lock on the motor was designed for easy, one-wrench bit changes and a shaft wrench is also included for those who prefer to use two wrenches to change bits. 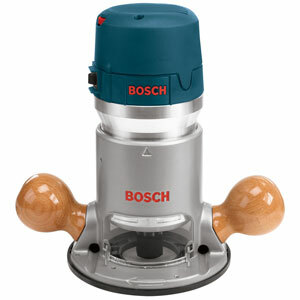 Bosch even covered the small details by angling the cord to help keep it out of the way. The contents of this kit make it ideal for all router users. 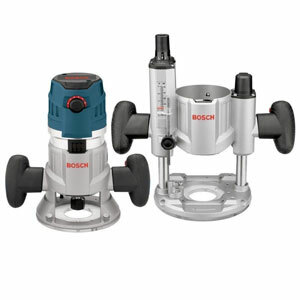 Collet Capacity 1/4" and 1/4"
Award-winning router with compact and powerful 1400W (2 1/4hp) motor and 8000-20000rpm electronic speed maintenance under load. Quick-fit pins located in base for rapid fitment to mounting plate. 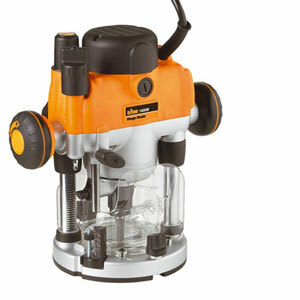 Easy-set, direct reading 3-stage turret for precise pre-set cut depths. 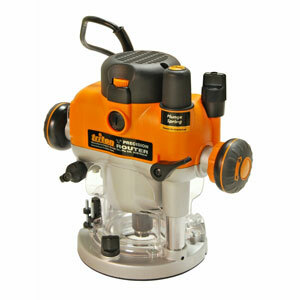 Single dial switch from plunge to fixed-base router with rack and pinion height adjustment. Powerful 2400W electronically controlled motor. Single spanner ‘above table’ cutter changing. Automatic shaft lock and power lock-off during cutter change mode. Fast plunge depth adjustment with winder handle and fine depth adjustment with micro winder. Quick switching to conventional plunge mode. Removable plunge spring for easy lifting and adjustment. Effective dust port.